One hundred scholars collaborated to produce this new translation, one which they envisioned not as a revision of earlier English translations, but as something completely original, derived directly from the most reliable Greek and Hebrew texts. The guiding principle behind the Holman Christian Standard Bible, or Holman CSB, or HCSB is neither word-for-word nor thought-for-thought translation, but a combination of the best of both principles called “optimal equivalence,” which seeks to convey the precise meaning of the original by the best means available in the language of the new version, with clarity and readability being high priorities. 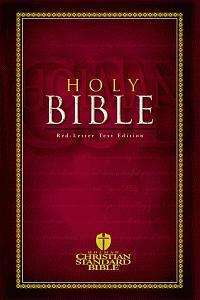 Plentiful footnotes are available to readers of this Bible, giving alternate readings and other information. Those who enjoy letting the Bible interpret itself will also be impressed with the abundance of cross references found in this work.